This silky, fluffy, shiny bit of luxuriousness is the perfect accessory for inducing tingling arousal, and has more uses than first meet the eye. If you're looking for a high-quality, yet reasonably priced way to indulge yourself or your partner, you've found it. The Tantra Feather Teaser comes to us from the luxury adult-toy makers at LELO, and has all the style, quality, and attention to detail one might expect from them. Its main purpose is to create lovely tingling sensations on your own or your lover's skin, and as such it can be used by anyone who isn't allergic to feathers. It's especially useful for building up arousal in a relaxed, unhurried way, teasing and tormenting your partner until s/he begs to feel your hands or mouth. This Teaser is, as one might guess, made mostly of feathers. They appear to be rooster tail feathers, along with some other, more downy feathers. The small handle is composed of highly-polished silvery metal, with a transparent acrylic accent colored to match the feathers. This acrylic section of the handle is engraved with "LELO" in small block letters, in case one should forget, or want to show off the brand name. The metal parts of the handle have a solid, weighty feel to them, and I found that the toy balances perfectly on one finger placed on the acrylic segment. This weight and balance makes it very easy on the hand holding it. 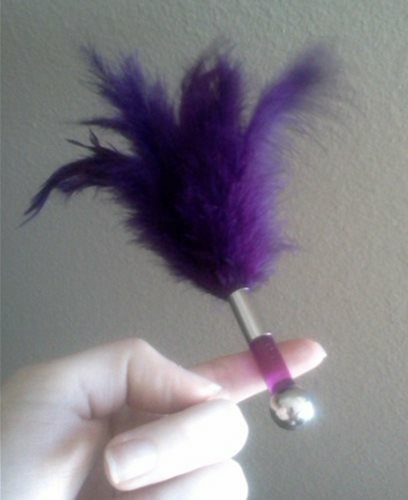 The small metal ball at the end adds to the ease of gripping, and also provides another possibility: it can be held in the mouth, enabling you to tease your partner with the feathers while leaving both hands free for other mischief. The Teaser is offered in sensuous jewel tones of red, purple, and black. 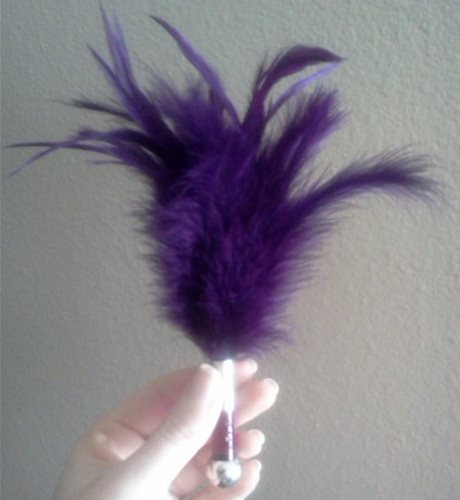 I chose the purple; the feathers are a deep amethyst violet, and the acrylic accent coordinates well in its slightly lighter, more orchid-toned shade. The handle measures 2 1/4" long, and is a mere 3/8" in diameter, about the thickness of a nice pen. The little ball at the end is about 5/8" across, and the entire Teaser measures approximately 8 1/2" from the end of the handle to the tips of the longest feathers. Because there are at least two types of feathers in this Teaser (some soft and fluffy, some slim and silky), you'll experience a combination of teasing, tickling, tingling sensations when they're trailed over your skin. Because the feathers are so soft, they work best on more sensitive areas: the back of the neck, around the ears, throat, chest, insides of the arms, sides of the waist, belly, front of the hips, buttocks and the backs of the thighs, behind the knees... The sensations can be varied more by either delicately using just the tips of the feathers, or applying more of the feathers' volume to the skin. In addition, because the handle is mostly metal, this gorgeous little morsel can be used for some light temperature play. Rest the handle in a little cold or warm water (making sure not to wet the feathers), then glide the silvery ball along your lover's contours. It will feel quite arousing when sliding around one's most intimate areas. The contrast between the airy softness of the feathers and the slick hardness of the handle can be divine. The Tantra Feather Teaser arrives in a glossy black box with an artistic, stylized image of the product and brand name on the front, and a brief description in several languages on the back. 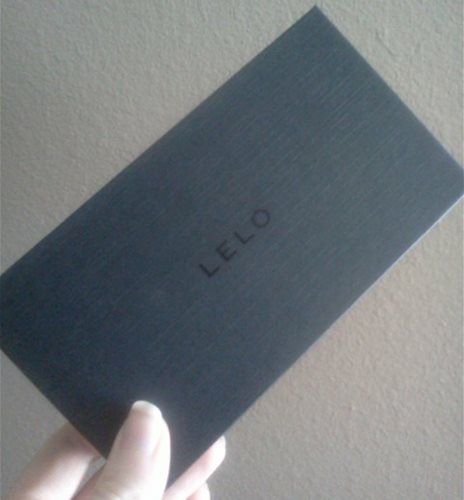 Inside this box is a nicer display/storage box, made of sturdy, cloth-covered paperboard (like the binding of a hardcover book), with the LELO logo on the lid. Lifting this lid will reveal textured white tissue paper folded over the Teaser. The feathered end is wrapped in an elastic cord with a black tag attached, reading only "LELO". The packaging is elegant, much like its contents, but the box is about two inches shorter than the Teaser's length, so the ends of the feathers must be curled around a bit to fit inside. For this reason, it doesn't make the best long-term storage option. 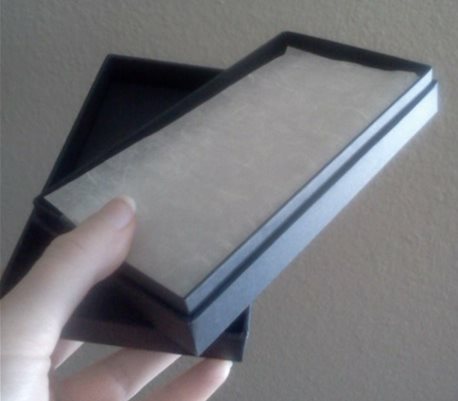 It is a very elegant gift box, however, and would be fine for short-term storage, or for storing other small things. Because feathers are delicate, natural, biological products, they require extra care in order to extend their life as long as possible. Dust can collect on them, moths and other insects can nibble on them, and they can simply dry out too much and break apart. To protect the feathers from damage over time, I suggest a nice-quality, airtight storage bag that is long enough for the Teaser to lie inside without having its feathers bent. Then keep it in a dark place, such as a nightstand drawer or toy storage chest. Feathers are very difficult to clean, so be sure to use your Teaser with clean hands, and on clean skin. She lifted my hair and made the nape of my neck tingle, then slowly flicked and fluttered the Teaser here and there, all over my body. Before long, I wasn't feeling sleepy at all! After luxuriating in the sensations for awhile, I decided to turn the tables and give her a taste. I'll just say that this little item will definitely be coming along with us on our little trip. Yes, this little item was an excellent addition to that mini-vacation. We both enjoyed teasing each other with it, whether blindfolded or not, whether bound or not. At one point, she did indeed hold it in her mouth and run it up and down my legs, while simultaneously sliding her hands over other parts of my body. Ahhh, heavenly! 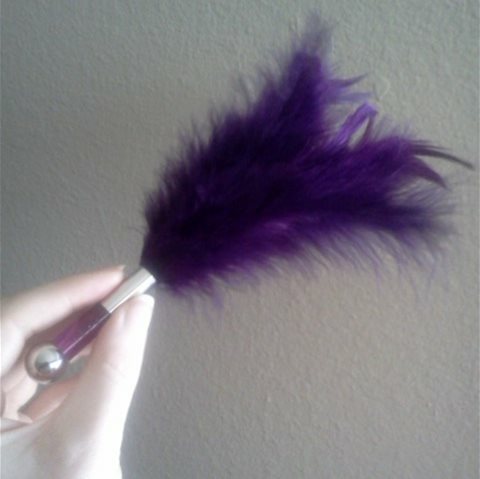 Sure, we could have gotten similar sensations from any feather tickler, but the weighted handle and overall elegance add a lot to the experience. I may just have to get the red one, as well. Reviewed by FieryRed (Eden Advanced reviewer) My integrity is worth more than the ability to work for toys. Might be nice if they were faux feathers! I enjoyed the review. They are real feathers? I sort of want the red one after reading the review! Yes, definitely real feathers. If they made one with faux feathers, I'd be all over it! The red one does look awfully pretty, and I have those red Tantric Ties wrist cuffs... Stop, stop! My collection is already taking over the house! Thanks for sharing! I've always been curious about these. Thanks for sharing the photos were very helpful I was wondering about the size.